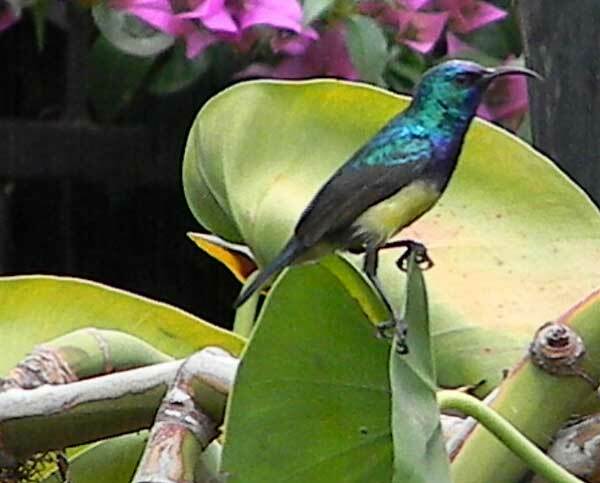 Variable Sunbird is a common sight in gardens, particularly in moist, highland gardens. Nairobi, Kenya. April 2011. Kenya has 33 species of sunbirds as listed in Birds of Kenya (Zimmerman et al.) 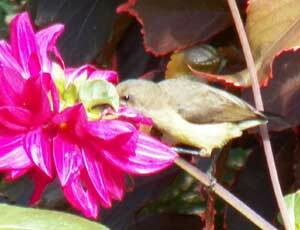 and the Variable Sunbird is probably the most frequently seen. Thus the student is wise to learn to recognize this one well. 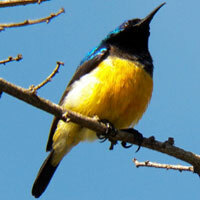 The unfortunate fact, however, is that the plumages of male and female sunbirds are very different. And, in the Variable Sunbird, male birds can present a variable amount of yellow or white on the belly and then take on female-like plumage when not breeding! Another difficulty is that the iridescent feathers take on different shades depending on the direction of light relative to the observer. All the more reason to spend a good amount of time in study of these active and beautiful birds.